A Life In Speedway by John Louis is a must read for any fan lucky enough to have watched John ‘Tiger’ Louis race. I was privileged to see John Louis race many times, as I watched Coventry ride between 1975-1983. He always gave a hundred per cent, never rode ‘dirty’ and always had time to sign autographs. 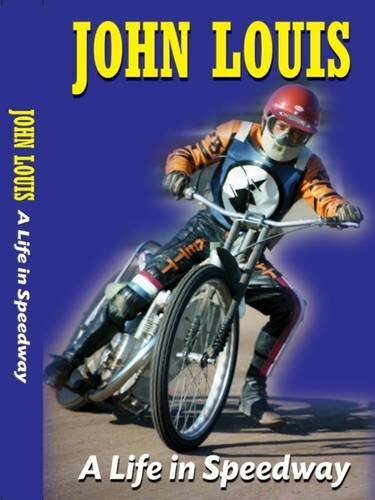 John Louis’ book documents his life, particularly his speedway years as both rider, promoter and England manager. He is both interesting and informative. He writes in a chatty style, so it feels like reading about a dear friend. John Louis is very open about his personal life too. It is interesting to read of his children and grandchildren’s achievements, and to put faces to names. I found it particularly moving when John Louis wrote of the suicides of both Billy Sanders and Kenny Carter – two events I clearly remember being both shocked and saddened about. The book is filled with photos – action and personal. And for those statisticians, they are included at the back of the book! I thoroughly enjoyed John Louis’ book and read it in just two sittings. For a speedway fan (and particularly us older fans), it is an absolute treat to read. John Louis comes across as a thoroughly nice guy. Pop A Life In Speedway on your shopping list today.